I have never made baked beans from scratch before, but these were decent for a first try. Bush’s Baked Beans are my favorite, but since we’re trying to avoid BPA from canned food… I’m going to have to come up with my own. I really have no idea what I’m doing, I looked at a few recipes and tried to combine what I thought was the best from each one. I wonder if I should put the ingredients in the crock pot from the start, so I may revisit this again when we’re in the mood for baked beans. If you have a recipe- I’d love to try it!!! Wash the beans and place in a crock pot with 8 cups of liquid, add onion and garlic. Cook on high for 6 hrs. Drain beans, but save 1 1/2 cups of liquid for sauce. Bring all the part 2 ingredients to a boil and then reduce heat to simmer for 10 minutes. 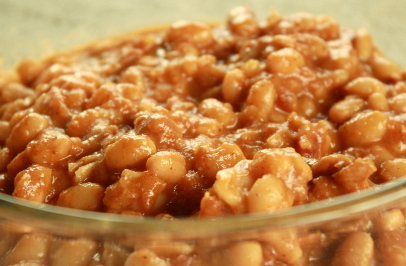 Combine beans and sauce into a 9×13 and cover with foil.